"You are such a nerd," said Editor-in-Chief Jonathan Kwan, "you have become one of those people." Being called a nerd is not something new to me, but being called one of "those people" is. To give some context, this was his response when I told him I spent much of my day watching the recent League of Legends playoffs and a Counter Strike: Global Operation tournament. I have been watching professional streaming games since last year, starting with North American League Championship Series every weekend. Some people may not see these people as "professional", especially as they think they just game all day. However, there is some big money to be earned in the world of professional gaming. For example, the 2015 Dota 2 championship, also known as The International, garnered an $18 million prize pool. In addition, there are actually quite a few e-sports organizations that cross over multiple games. I know today's sender of our products, Fnatic, for their League of Legends team, but of course they have teams for other games such as CS:GO and Dota 2. Most recently however, they showed off their newest acquisition. Rather than adding a new game to their organization, they unveiled a new lineup of gaming peripherals. We have seen gaming companies endorse certain products, but this is the first times I have seen an e-sports team produce their own peripherals. 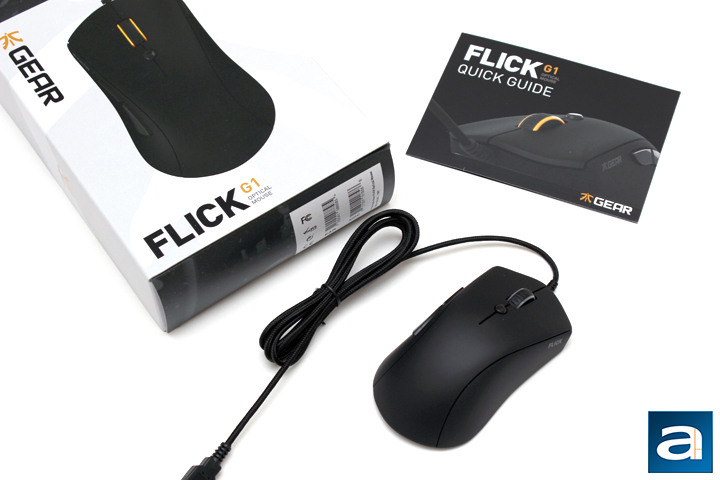 Today, we have the first of several Fnatic Gear products, their Flick G1. How will it fair in everyday use, and more importantly, games? Hopefully today's review will answer this question and more, so read on to find out! 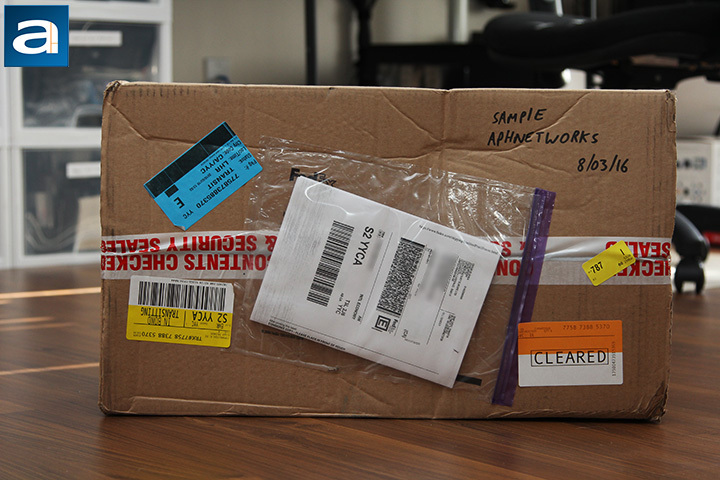 Today's review unit of the Fnatic Gear Flick G1 shipped with the guys at FedEx, with the International Economy service to get to our APH Networks Calgary location. Overall, the box looks to be in average condition. There are some bruises near the top of the box, but nothing to really worry about. 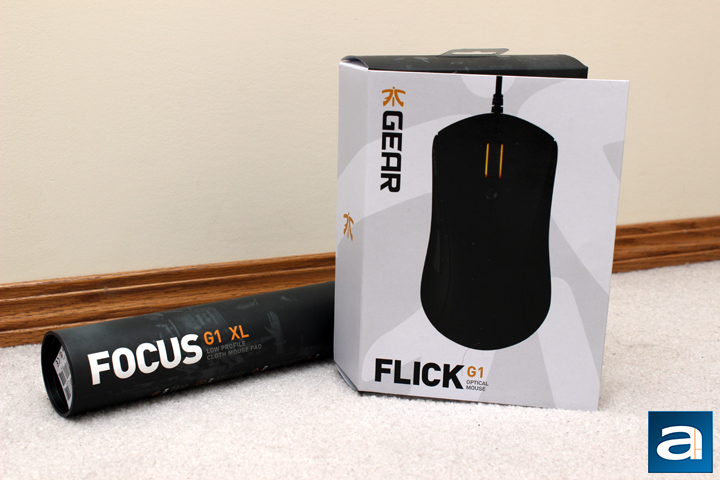 Along with the Flick G1, we also received the Fnatic Gear Focus G1 XL and the Rush G1. The mousing surface will be reviewed by myself in the coming weeks, while Editor-in-Chief Jonathan Kwan will be covering the keyboard. If you look at the history of Fnatic Gear, you will see how short it is. Rather than starting from the ground up, in November 2015, Fnatic acquired Func. They also previously made peripherals, such as the HS-260, the KB-460, plus some mice and mousing surfaces. Thus we can see Fnatic Gear's products are not necessarily a new start, but a refinement upon the foundation from Func. The Flick G1 most closely shares resemblance with the previous Func MS-2, so I will be comparing the two mice throughout the review. Taking a look at the retail container of the Flick G1, we can see Fnatic's orange and black colors on the box laid on top of a white and gray background, which actually depicts a part of the Fnatic logo. The front panel shows the mouse from a top down perspective. The company's name and logo is listed on the top left side, and the product's name is underneath in the corner. As you may have noticed from the picture above, the front panel swings open to display the mouse itself. Inside the front panel, we have specifications about the mouse. This panel is held closed by some magnets, making for a more elegant solution than Velcro found on other people's boxes. Otherwise, the back has some more features for the Flick G1. Out of the box, we have a two things to note. For one, we have the mouse itself, held in a clear plastic tray. Second, we have a small quick start guide, which goes quickly over all the buttons and hardware features. One thing I really wish Fnatic Gear included with their peripherals would be some decals and stickers. While it may seem like just random paraphernalia, as this is an e-sports organization, I think fans of Fnatic would appreciate this small but neat gesture. In addition, since the initial target market of their products would be fans of their teams, they would enjoy this add-on more. Otherwise, there is not too much else to note, so let us take a closer look at the Flick G1 itself.